Cyberattacks against Banking and Financial Institutions have evolved from annoying pop-ups and machine crashes to denial-of-business events. CxO resignations and losses/damages running into crores of Rupees have heightened the awareness around cyber security, and shifted it from an IT problem to a business priority risk. Recently, Asia has been a hotspot for such cyberattacks, with many high-profile attacks being the subject of headlines across the region, including the most recent Bangladesh Bank breach. In its latest annexure to banks titled “Cyber Security Framework in Banks”, RBI has outlined a number of proactive measures that Banks in India need to take to ensure a robust cyber security/resilience framework, and to ensure adequate cyber security preparedness on a continuous basis. 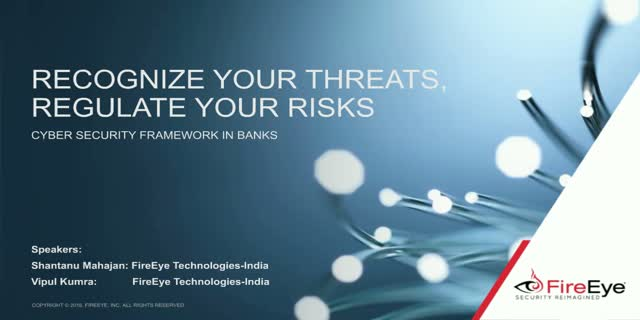 FireEye invites all banks and financial institutions to join this exclusive webinar where the speakers will review the RBI guidelines and suggest ideas to bolster your response strategy and limit the consequences of a breach.